Those who suffer from tailbone pain find the coccyx cushion the most comfortable due to the cut out at the back of the cushion. This cut out design significantly reduces pressure on the tailbone. 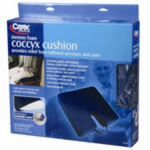 The Carex® Coccyx Cushion is ergonomically designed to provide support while reducing direct pressure on the tailbone. Made of premium quality, high density self molding memory foam. The removable soft polyester and rayon cover zips off easily for machine washing. Cushion has a handy strap for travel. Hypo-allengenic. Blue cushion measures 18" l x 16" w x 3" h.